The massif of Psiloritis with its higher peak Timios Stavros (2456m) is situated in the center of Crete between the prefectures of Rethymnon and Heraklion.. In spite of the large area it takes up, only a part of it is suitable for ski mountaineering, the one above the villages of Anogia - Zoniana - Livadia in the north and the villages of Kamares - Lochria - Kouroutes - Fourfouras in the south. The best season is from mid January until even mid April depending on the quantity of snow. On the mountain there are some buildings and refuges at relatively good spots that can offer shelter for two-day routes thus avoid carrying a tent (described below - see map). From the northern side we prefer the road from Anogia to Nida plateau (21km); it is an asphalt road and if we are lucky enough, it might have been cleared from snow. From the other two villages there are only dirt roads leading to the mountain with the usual trouble (dead-end in sheepcotes, getting stuck in the mud etc). From the southern side we prefer access from Kouroutes and the refuge of the Alpine Club of Rethymnon at Toumbotos Prinos, which is reached by a dirt road or from Lochria by another dirt road up to the southern slopes of the peak Ekdora (1884m). This route actually follows the E4 with a small deviation. Starting from Nida we follow the dirt track leading to Ideon Andron Cave, where Jupiter grew up according to mythology. At the third right corner of this road we meet a small metal sign of E4 and we get into the path. In the beginning we traverse up the slope leaving Nida behind us and heading S - SE. During this first half hour we usually carry the skis causing us some trouble maybe, but with a bit of luck - and much snow! - this part can be rather interesting. After this slightly difficult start the path enters a smooth gully heading SW - W that offers us a relatively easy ascent up to the saddle above Akolita - Kalogerou Vathoni plateau. Here we can have the first slide down of the day until the plateau where we meet a big, square, yellow sign of E4, if it isn't buried under the snow! We continue heading W - NW in another smooth gully up to the bottom of Agathias peak (2424m), the second highest of Mt Idi. Here we have a small deviation from E4: The path normally traverses Agathias from the northern side but in winter it's nearly always frozen and the use of an ice axe and crampons, while carrying the skis on the back, is necessary. So we climb up the peak of Agathias from the eastern side - a wide gully - and then we go down the western side until the saddle point between Agathias and Timios Stavros. 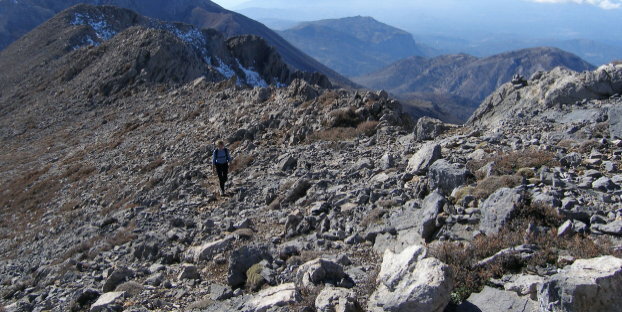 We continue our ascent heading W until the highest peak of Crete. The view from the top makes amends for the tiresome ascent, as nearly the whole of Crete lies at our feet: in the west the imposing massif of the White Mountains, in the east Dikti (the mountains of Lassithi), in the south the plain of Messara, the Asteroussia mountains and the Libyan sea while in the north we can see Heraklion, Rethymnon, the Cretan sea and if the visibility is clear even Mt Taygetos of the Peloponese in the NW! Doing this ascent we could spend the night on Nida (at the "Chalet" building, where the asphalt road ends) and from Lochria at a small house in the west of Ekdora. If we start from Lochria we begin by first heading N - NE on a dirt road usually covered with snow up to Akolita plateau and then heading W - NW and get into E4. From the ski resort heading W we come across the small house described previously. We go on W across the plateau until the fence that is the border between Zoniana and Livadia. The access to that point can be reached from Zoniana too, but then the Kourouna plateau is reached either from the east or the west depending on the dirt track we follow (not recommended though as the dirt tracks are like a maze). From this point we have two possible routes ending at the same point, the Agathias - Voulomenou saddle point with an E4 post. The first ascent heads S, in the prominent wide gully above the fence. The second one heads E - SW up to the bottom of Timios Stavros and from this point we go up the Douskas gully heading E - SE until the saddle. To climb up Timios Stavros from here we have to move to the east, leaving the peak behind us, to get to the eastern side of Agathias and climb up as described in the route from Nida - E4. This route is more demanding than the previous ones with many chances of carrying the skis and using an axe and crampons at the first part. From the ski resort we climb up the slope exactly above the ski lift heading S - SW reaching either the Kousakas peak (2207) or to the west the saddle point between Kousakas and Voulomenou. Then heading W - SW we reach the bottom of the eastern side of Agathias and we continue to Timios Stavros. From Kouroutes we go up to the refuge of Rethymnon Alpine Club, where we can spend the night after arranging with the local Alpine Club. From the refuge we follow the E4 path heading N - NW - NE until the bottom of the southern side of Agathias through relatively smooth slopes and gullies and we continue W - NW until the saddle point of Agathias - Timios Stavros and the peak. This route is the shortest of all but the price for the ascent is the relatively short descent. The orientation of the slopes here is mostly to the south and the adhesive skins are nearly always enough. Nevertheless, we'd better have the ski crampons and the walking axe and crampons with us for the part from the saddle point to the top. Depending on the starting point we can reverse the route of the ascent or combine various routes, for example ascent from Nida - descent from Kousakas saddle (steep!!!) or ascent from Lochria - descent to the refuge or even better ascent from the refuge and return to Nida - provided that there is someone who can drive around and pick us up. We should also have in mind the snow conditions - possible avalanches on the north slopes - and, of course, our own descending abilities. The longest but easiest routes are the ones from Nida and Ekdora, whereas the most difficult ones are the ones from the ski resort and the north face of Psiloritis. What is quite interesting and adventurous is a, say, full crossing of the mountain starting from the village of Platania from the south or Livadia from the north ascending to the summits Spathi (1778m), Stolistra (2325m), Timios Stavros (2456m), Agathias (2424m) and returning to Nida or Lochria (depending on the starting village) or the other way round spending the night in a tent or a snow hole. Some medium size nuts. Ooops, sorry!! As always, with touring skis it is necessary to have skins and ski crampons but also a walking axe and crampons. Oh, yes! Don't forget to sharpen the edges of your skis for the north slopes. Moving in rope parties is not necessary. It could help psychologically, though, on some difficult and scary slopes above the ski resort. All the routes described are on slopes of about 30 - 35 degrees. 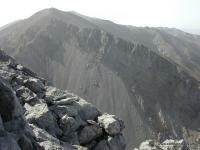 You should estimate 2 - 6 hours to ascend and 1 - 3 hours to descend depending on the route. Bear in mind possible avalanches in the area of Timios Stavros and Kousakas. Finally, if a local invites you for a "raki", don't refuse! Firstly because you'll miss something extraordinary and secondly because he will take it to heart and surely you don't want to offend a Cretan man!